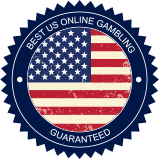 Online blackjack strategy involves primarily knowing when you should stand, hit, double down, surrender, or split and then utilizing some other important strategies. This is a game that calls for sound math skills and good decision-making. Of all the table games at a casino, blackjack is the one that truly does call for the player to utilize strategy to increase their chances of winning. With blackjack, you are playing against the dealer and no one else. As a player you want to get as close to 21 as you can without going over, which is also known as going bust. In order to win, you must be closer to 21 than the dealer. Normally, a winning blackjack hand pays 1-1. But if you win by hitting blackjack, you’ll usually get paid on 3-2 odds. Overall, this skill- and luck-based table game is fairly easy to learn to play. Here’s how to play and some useful strategies for what is the most popular online casino game around. Below you’ll find common blackjack terms related to play. These terms will help you define and understand specific situations in which you may find yourself. Double or Double Down: When you double down you place an additional wager on your hand equal to your original bet. You may then draw one more card and then you must stand. Even Money: This occurs when the dealer’s up card is an Ace and the player has blackjack. The player may then elect to take even money, getting paid immediately 1-1 without the dealer getting another card. If the hand is played out, and the dealer has blackjack, it’s a push and bets are returned, while the player also receives double the insurance. If the dealer does not have blackjack, the player loses insurance but they get paid 1.5 times the original bet’s value. Five Card Charlie: If you are dealt five cards without busting, then you’ve got five card Charlie and get 2:1. Hit: When you ask for an additional card. Insurance: When the dealer shows an ace you can decide to place a side bet equal to half the value of your original bet. You’re betting on the dealer having blackjack. If they do, you get your wager back and the value of the initial bet. If the dealer does not have blackjack, you lose your wager. Push: A tie, which results in your bet being returned. Soft: A soft hand has an Ace that is valued at 11 and not 1 . Split: A split occurs when a player is dealt two cards of the same rank and the player decides to play each separately. A bet is placed on each one. Stand: When you stand you stop asking for cards. Surrender: You may be allowed to surrender, which results in your retiring your hand and receiving half of your original wager. 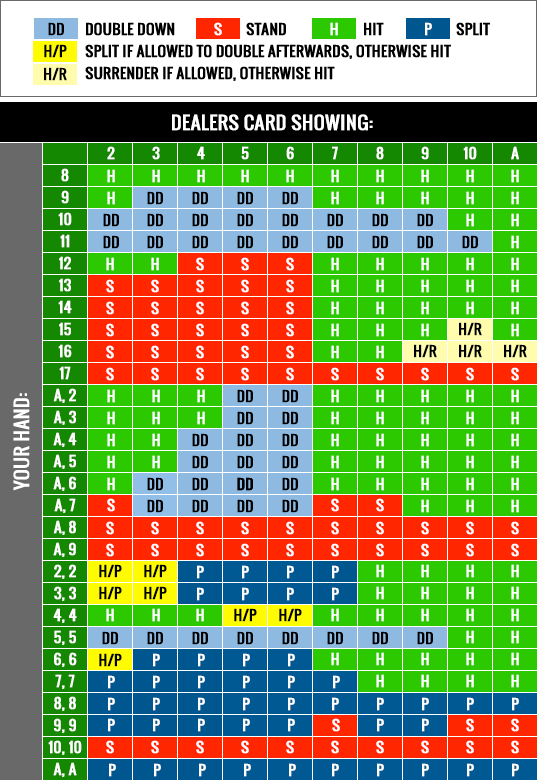 Up Card: The one card that the dealer is showing. There’s no way to know what cards have already been used when you’re playing online blackjack. Everything is computer generated and about as random as it gets. That means following the strategy chart below is essential to your success. Use it for every hand. The chart tells you when to stand, hit, double down, etc. This online blackjack strategy matrix works if playing with four or more decks and if the dealer has to stand on soft 17. It’s also good for common variations of this very popular game. In utilizing this online Blackjack strategy, compare your hand with what you can see of the dealer’s hand. What you should do in any case is dictated by comparing your situation with the dealer’s, giving you the best chances of taking the hand. There are, of course, no guarantees here. But following this chart will certainly increase your chances of winning more hands. Here’s a quick summary of some of the more common moves you should make when playing blackjack. It’s important to understand what should be done at any given time. Decisions are made in relationship to what you are holding and the up card shown by the dealer. Double down if you have 11 after one card or 10 after two are dealt. You’d also double down if you hold from Ace, 2 to Ace, 7 and the dealer is showing 5 or 6. Always stand on 10, 10; Ace, 8; and Ace, 9. Also, you would stand on 17 no matter what the dealer is showing. Always split Aces and 8s. Also commonly split are 7s and 9s. There are other times that you can split your cards, including certain occasions when you have 2, 2 or 3,3 and the dealer shows 4 through 7. Never split 10s. Here are six essential tips you’ll want to add to your blackjack strategy. Use them wisely. Decide ahead of time what your bankroll will be for your betting session and do not exceed it. Choose a blackjack table where the maximum wager is no more than 5% of your bankroll. Why? You need to leave room in your bankroll to play—to lose as well as win. Memorize the strategy chart, memorize the strategy chart, and memorize the strategy chart. Don’t try to beat the dealer. Try to get as close to 21 as you can. You can’t do anything about what the dealer is holding, and you won’t know until both of his/her cards are revealed. Vary how much you are wagering according to your results. If you’re winning, then up the ante and if losing, then retreat; pull pack your betting amount until you start winning again. Play at a normal pace, don’t get stuck in a common online trap, playing quickly and making instant choices. Online blackjack calls for players to be involved in each turn of the card. Ongoing decision-making is an important aspect of this game. Play smart, stay fresh and be alert, or you won’t be able to apply your online Blackjack strategy properly. Of all the casino games around, blackjack offers a huge amount of action. Use these strategies to your advantage.